High Pressure Filters HF are used for industrial applications with pressure up to 50 bar (725 psi). Strong cast aluminium construction assures safety operating at high pressures. 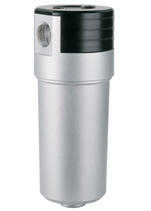 6 filtration grades enables elimination of impurities from compressed air in a temperature range 0-120°C.